WWW, June 2014 - Starting off with a selection of Jamaican steppers vocals plus dubs, only to go over into the UK versions of this militant Reggae drum rhythm: this is conscious Rasta Roots Reggae from the 1970's and beyond. Every title comes with a Dub version or is played in Discomix style (vocal version plus dub in one extended mix). 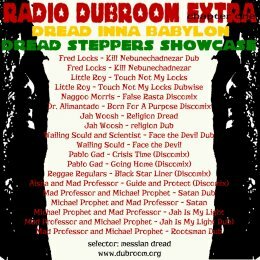 This is conscious Reggae Music, dealing with the many trials and tribulations Jah people have to go through while still in this Babylon. A message of strength, identification, truth and righteousness. Enjoy the militant vibes when you love Jah!